Washington overcame James Harden's season-best 54 points to outlast the Houston Rockets 135-131 on Monday night. WASHINGTON (AP) — Even the Wizards seemed surprised by the way they won. Bradley Beal said he couldn’t have imagined allowing the opposing starting guards to combine for 90 points and still get a victory. 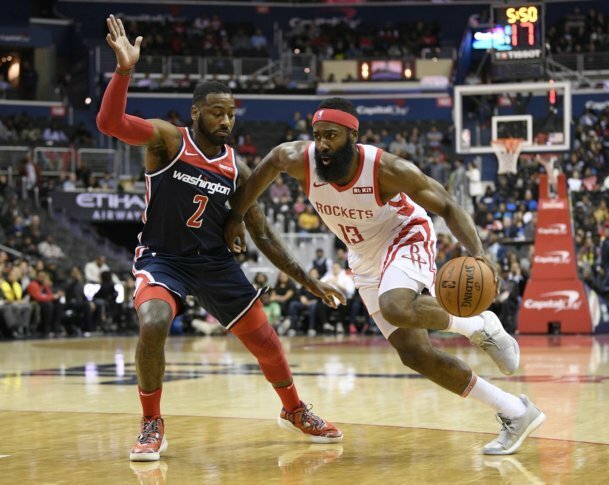 John Wall scored a season-high 36 points, including six in overtime, and Washington overcame James Harden’s season-best 54 points to outlast the Houston Rockets 135-131 on Monday night. Otto Porter hit a runner with 4:37 to play for the first basket in overtime and the Wizards remained ahead from there. Wall followed with a jumper to make it 129-125 and later made another jumper that pushed the lead to five. Beal’s dunk extended it to 133-126 with 1:50 to play. Harden had 44 points through three quarters but missed five of his seven shots in the fourth. In overtime, Harden whose career high is 60, was 1 of 2 from the field and had two free throws. He had 11 turnovers, three in overtime, and 13 assists. Houston raced to a 27-10 lead, but Washington clawed its way back. Markieff Morris had 22 points and 10 rebounds for the Wizards. Clint Capela had 17 points and 14 points for the short-handed Rockets, who played without Chris Paul for the second straight game and fell to 9-10. Rockets: Paul was listed as being out with a sore left leg, though coach Mike D’Antoni classified the injury differently. “We’ve just got to make sure Chris gets 100 percent well from his strained hammy,” D’Antoni said. … G/F Gerald Green missed his third game with a sore right ankle. … Houston added F Danuel House from the Rio Grande Valley Vipers of the G League. … Made their first seven 3-point shots, then missed 10 straight. Wizards: C Dwight Howard was out for the fourth straight game with a glute injury. “It’s a slow process,” coach Scott Brooks said. “He’s doing everything he can.” . Morris, F Kelly Oubre Jr. and Beal picked up technicals. … Allowed 42 points in the first quarter, the fifth time this year they’d given up at least 40. … Wall passed Wes Unseld for third place on the franchise career scoring list. Wall said that despite allowing 54 points to Harden, Beal did a fine job against him. D’Antoni knows he’s asking too much of Harden, who played a season-high 47 minutes. Besides Paul and Green, the Rockets are without G Brandon Knight (left knee), C Nene (right calf) and F/C Zhou Qui. Knight and Nene haven’t played at all this season, and Qui has played one minute. It hasn’t gotten Gordon down. Wizards: Visit Pelicans on Wednesday as Washington plays six of its next seven on the road.